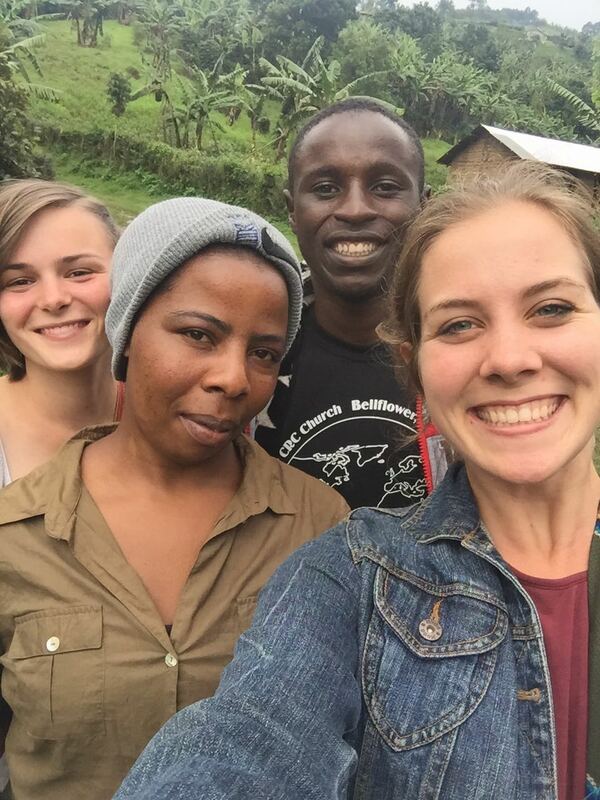 It is so hard to believe that it has been nearly 6 months here in Kabale, Uganda! The friends and family I've made here will truly be friends and family forever. 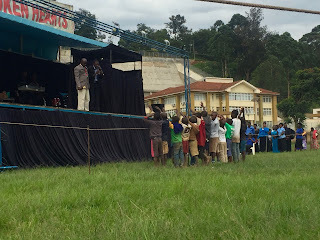 As I wrap up my time in Uganda, we have been seeing God at work in marvelous ways, both in our own lives and in the lives of those around us in Kabale. In late February, we hosted 2 visitors from the US World Renew office who came to do evaluations of the Community Development Department's Agriculture field. 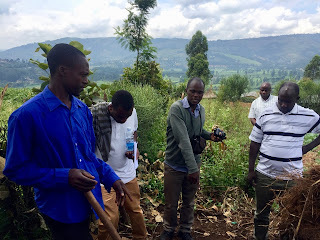 On February 21st and 22nd, we went to visit farmers in surrounding communities to observe the vast impacts that the implementation of programs like Farming God's Way has had on farmers and their families. We visited the village of Kitumba where the village PAG church pastor maintains a farm. He told us of how difficult the early stages of his life and marriage were when he lost a job working as a security guard and his wife was forced to live with her family until Deos found a way of income. He began farming, and discovered who Jesus was and surrendered his life to Him, and since then has cultivated a sustainable farm, is now the pastor of a local church, and lives with his wife and 2 children in primary school. On February 23rd, Sarah, Lianna, our friends from a local hospital, Ivan and Leonard, and I went to Sarah's home in Kyanamira village to pray for and share the Word of God with Sarah's bedridden father. Muzee (old man) has been bedridden for years as he battles with hypertension and kidney issues. As we worshipped God in his small bedroom, we believed God for the impossible things in life. As you believe with us, please keep Sarah's father and family in your prayers. That night, I had the privilege to speak at PAG Central's youth ministry called Urban Nite. There was a panel of 2 of us and our interviewer who asked our opinions on everything about time management- from priorities to the stigma of "African time." 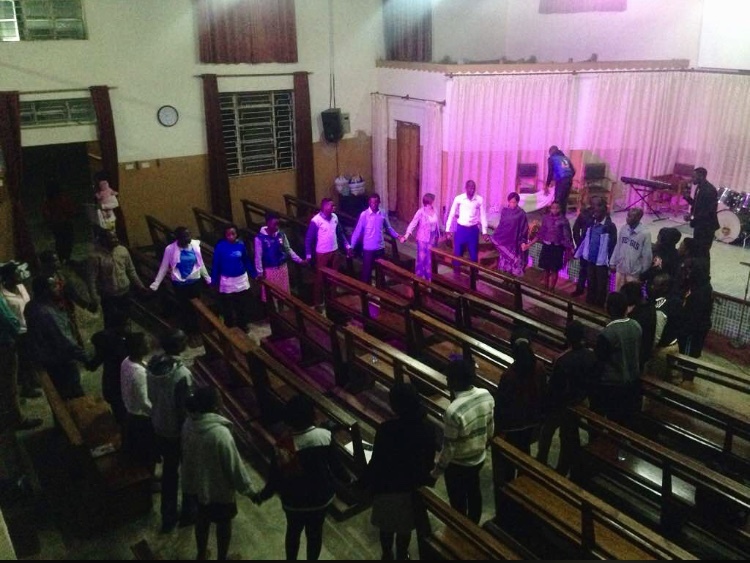 Urban Nite has become one of my favorite times to fellowship with fellow youth around Kabale, to meet new people, and to come alive as we worship God! 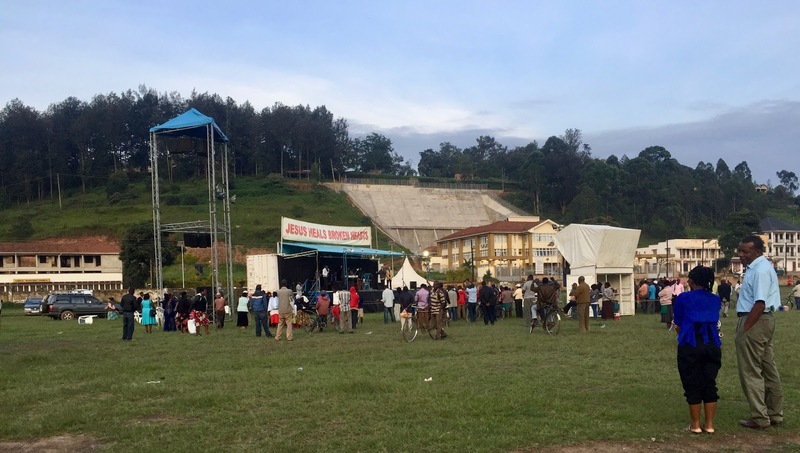 From March 1st to March 5th, German evangelist Peter Franz, who runs Gospel Fire International (http://en.gfi-ministries.org) in neighboring Kenya made his way through Uganda to Kabale to preach the gospel! 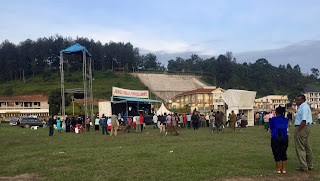 Kabale stadium setup with the banner and theme "Jesus Heals Broken Hearts"
After the office everyday, we headed to the town stadium to hear the good news preached to anyone and everyone in Kabale. What an incredible time to be a part of God's great desire for people to come to Him! God was also faithful in holding back rain that typically happens every day in this rainy season until the very end of the last day! March 8th was International Women's Day, and as a public holiday here, we hosted 5 of our girlfriends to celebrate with chapatis (incredibly fattening street snack), music, and nail polish. More recently, Sarah, Lianna and I traveled to a village called Kaharo to visit the home of our friend Ably. We boarded a taxi for about 10 minutes and after being dropped off on the side of the road, we began the long hike to his home on the mountain side. As we walked in a valley, we marveled at the tall green mountains and the quietness. As heavy rains have wreaked destruction on some farms, workers were in their gardens caring for this season's cabbages, beetroots, and cauliflower. As we reached his home, we were welcomed with a beautiful view of 3 surrounding mountains tall enough to nearly touch the looming rain clouds. We spent the afternoon touring the luscious garden which had fruits like guava, passion fruit and bananas, and all types vegetables, from cassava to cabbage. Ably's cousin was kind enough to dig up fresh cassava, pick some avocados and cabbages for us to bring home! Before leaving, we had to partake in a delicious lunch prepared by Ably's mother which consisted of things grown in their garden. As I prepare to host my mother and our family friend at the end of March, I am so grateful for every opportunity the Lord has provided for joy, adventures, and callings in our lives here in Kabale! 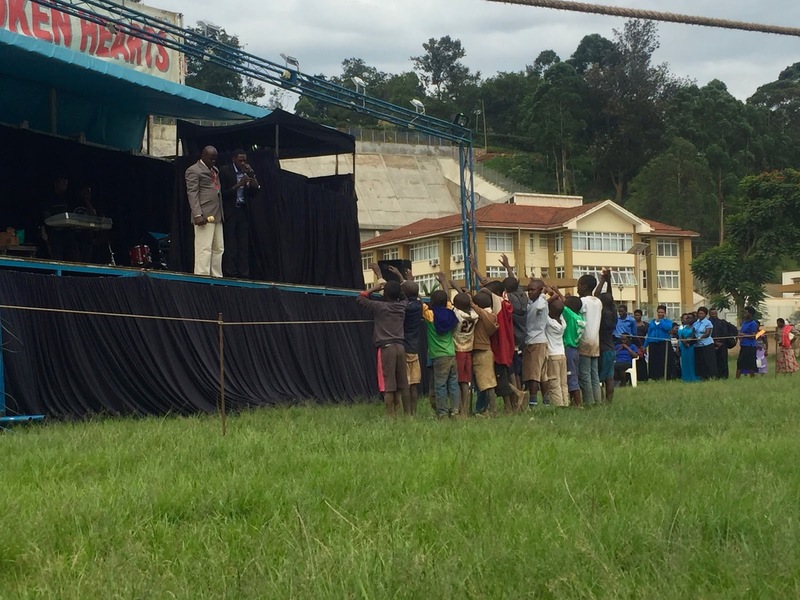 Thank you for being consistent in prayer for the people, church and livelihoods of those in Kabale. I am getting anxiously excited to be home in Lexington, Kentucky (and Sarasota, Florida) sharing about this great journey!